These American-made, hand-finished stoneware butter churns are the perfect rustic home and farm decoration. They are fully functional, extremely durable, and lead free. 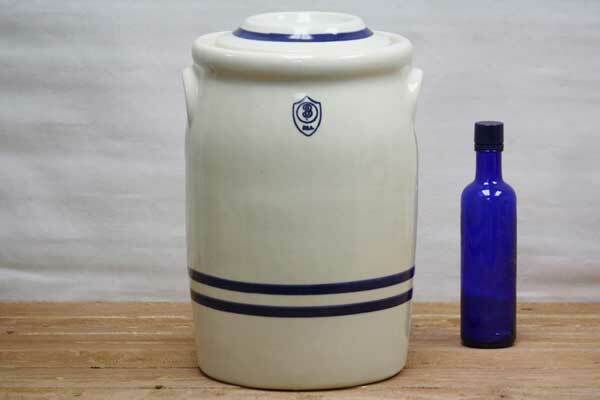 The glazed stoneware pottery of our butter churns is easy to clean. They are dishwasher, microwave, oven, freezer and food safe. These vintage butter churns can be purchased with or without a functional dasher. The dasher can also be purchased separately. Due to the natural pottery process each stoneware butter churn is unique. After cows are milked, the milk is left to settle in a cool place so the cream rises to the top. By afternoon the cream is skimmed off and put into the butter churn. Some would wait a few days to collect enough cream to be worth churning. A little fermentation ripens the cream. The stick or dasher is moved up and down in a stoneware churn with a lid. Agitating the cream produces butter by separating yellow fat from the buttermilk. The ceramic butter churn is the long way of making butter, so when you do it, make sure to sing a song (it's a tradition)! Butter making is a slow process that takes energy, but needs only simple equipment. While milk spoils quickly, making butter and cheese was a way for early humans to preserve food long-term. By the early 1800s it was becoming less common in Europe for ordinary families to make their own butter. However, early in the 1900s of rural America these low-tech old butter churns were still well known. We also carry vintage moonshine jugs, stoneware crocks, and stoneware bean pots.